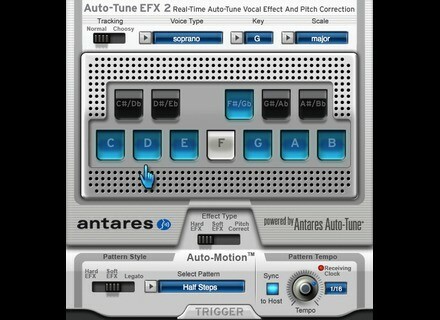 Auto-Tune EFX 2, Pitch Shifter / Time Stretcher from Antares Audio Technology in the Auto-Tune series. Product replaced by the Antares Audio Technology Auto-Tune EFX 3. Antares announced the availability of Auto-Tune EFX 2, the next generation of the real-time pitch correction tool and creating the Auto-Tune Vocal Effect, now with Auto-Motion Vocal Pattern Generation. Powered by the same technology as Antares' Auto-Tune 7, Auto-Tune EFX 2 is a tool for real-time pitch correction and creating the iconic Auto-Tune Vocal Effect. And now, with its new Auto-Motion Vocal Pattern Generation, you can add a variety of musical patterns to your track for a new vocal effect. 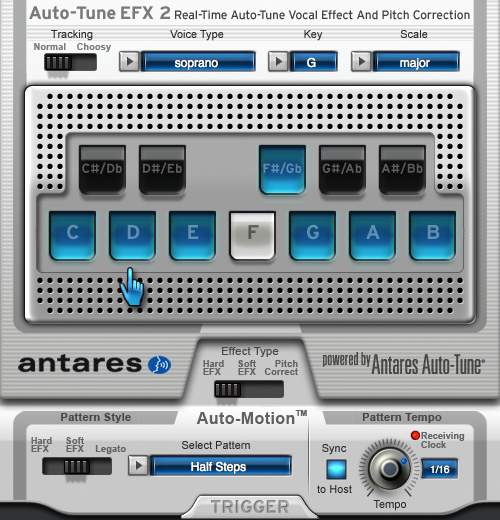 Auto-Tune EFX provides two different flavors of the Auto-Tune Vocal Effect as well as Antares' real-time pitch correction. Select your desired effect type, set the key and scale of your track, and Auto-Tune EFX does the rest. For songs with complex chord progressions or modulations, you can optionally set up custom scales or use your host's automation facility to allow the processing of vocal lines. You can learn more about it here: Auto-Tune EFX 2 and download a 10-day trial version (iLok required). NI Maschine Mikro Available Native Instruments announces that Maschine Mikro, a basic version of its groove production system, is now available worldwide. Xenium Audio XR-1 Xenium Audio is a new audio software development company and recently announced XR-1 convolution reverb VST plugin.